Farnham Brass Band Training Band"
The Training Band is an important part of Farnham Brass Band and has continued since the band started in 1975. Rehearsals are held just prior to the rehearsal for main band. The Training Band is suitable for anybody interested in learning a brass instrument, players that have lapsed and wish to play with a band again, or those who just wish to practice for fun. 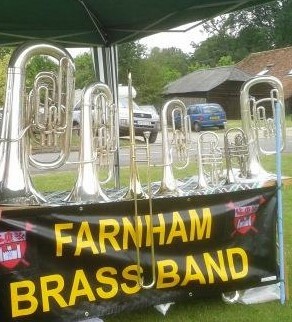 tenor horn, flugel horn, cornet or drums !! IMPORTANT NOTICE: The training Band is suspended until further notice.